BUT IT’S NEVER TOO LATE FOR REDEMPTION………. From the moment Quinton sets eyes on Deidre Chattan, rational thought vanishes, for in her eyes he sees a fiery spirit that matches his own and he’ll be damned if he’ll let such a wild Scottish rose wither under the weight of a nun’s habit………. Mary Wine takes you into the rugged Highlands and into the heart of their kilted warriors with her unforgettable Highlander Series. In Highland Heat, she brings us the story of Quinton Cameron, a true Highland warrior, and the woman he desires, the strong willed, Deidre Chattan. This is the story that I have been waiting to read, and I have to say that I was highly impressed. Mary Wine has this way of writing where she incorporates the smallest of historical details that really make the book come to life. If you are looking for a historical romance that offers not only romance, history, and tension, but strong plot, and even stronger characters, then Highland Heat is the book for you. 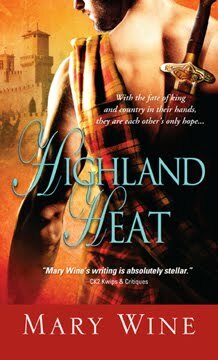 This is the third and final book in Mary Wine’s Highland Heat trilogy, and while it is part of a series it can be read as a stand alone. Although trust me, once you have read on you will want to read the other books in this series. I WOULD LIKE TO SAY THANK YOU TO MARY WINE FOR PROVIDING THIS AMAZING GUEST POST! Hello Everyone, is that spring that I feel in the air? Not sure but I think I can feel my toes. I’ve been waiting for March because Highland Heat is a book I really enjoyed writing. Not just because it was the third book in the saga, although it’s always satisfying to see how a saga is going to finish….but because I wanted to see both Deidre and Quinton in love. They’d both been jilted and I wanted to see happiness settle on them both. But I also wanted to get back to Scotland. It’s an amazing country, rich with history. I often get my books ideas while reading through historical facts. Strange, I know but as I am shifting through those dates and dry facts, I often think of the people living through it all. I mean, there were still weddings and little girls looking forward to the day they’d get married. Holidays made people excited and you know they cooked up special foods on those days. When I begin thinking like that, I find myself prowling through even more texts to find recipes from the time period. Once I do that, I often try to cook them up, to see what they tasted like. I can now make a fine pudding I don’t mind telling you but it does take quite a while to boil them and I did cheat and use my stove instead of trying it over the fire. The music of Scotland has always intrigued me. Now it’s available on CD but I recently went in search of it being played live. The sound of ‘unplugged’ music is very interesting. Where it’s being played matters too. Inside of a home, inside of a church or outside on a warm spring day. The devil is often in the details. One of the most interesting things I’ve done recently is to attend a period dinner, where everyone dresses up in the style of dress from the time, and we gather, eat and enjoy the evening as might have way back then. This one was set in 1550 and no modern lighting allowed. There were shadows everywhere but they only add to the moment, The jewels sewn onto the dresses sparkle like tiny fireworks. The sound of the wooden dishes was different and having live music really added to the moment. It felt like my senses were heightened, like I was trying to absorb every moment, it was wonderful and you’ve never heard a sonnet read, really read until you’ve done it by candle light with a harp in the back ground. I noticed more details, the way the younger girls flutter their eyelashes and the way the candle light played across my husbands face. The pepper was served with a tiny spoon because it had been hand ground before the meal began. It was as much as feast for the senses as the stomach. I’ve got to do it again soon. Next is an 1885 picnic, including swimming. Let the sewing marathon begin (did I mention I make my own costumes?)! I have two copies to giveaway. This sounds like a book I'd like to read! Sounds wonderful. Please enter my name. Thanks. Hi, Mary! Thanks for sharing! I can't wait to read your new book! I am one of those readers that wants many little details of everyday life and history incorporated into the stories I read. I read historical fiction as a way to gain insight into the time period and of the people. I want the information in the books to be accurate. It may be fiction, but the framework it is built upon should be factual - actual events, correct dates, correct historical figures, and an accurate depiction of the way people lived and society functioned. I wish we had accurate reenactment dinners in our area. We attend reenactments and any such events we can when we find them. I have the patterns and some of the fabric. Now all I need is the time to sew. This trilogy is on my Wish List. Medieval and the Highlands have always been my favorites. Sounds like a good and interesting romance. I would love to read it. Please enter me. Thanks!